The bigger the catamaran, the better looking it tends to be. Attempts to maximize the living spaces in smaller cats can result in rather dumpy boats, but if a designer/stylist has plenty of LOA to play with, the result can be downright elegant. Jean-Francois Fountaine, founder of Fountaine Pajot, first started building successful racing monohulls as far back as 1976 and launched his first multihull, a 60-foot ocean-racing trimaran, in 1981. In 1983 the firm shifted its focus to mass-production cruising catamarans, bringing to bear its considerable performance-boat experience, and it has since become a major player in this market, launching 30 different models and over 2,200 boats. Several of these have been quite large boats ranging up to 80 feet in length. 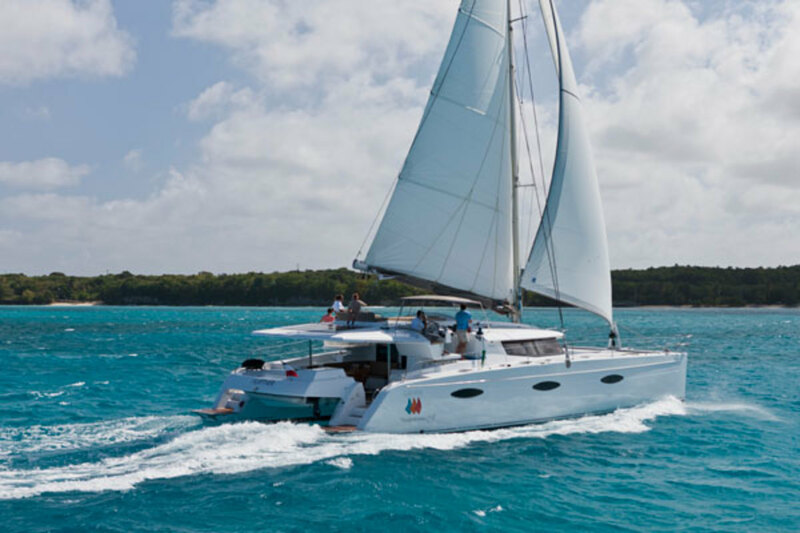 Fountaine Pajot’s latest flagship class cruiser, the Sanya 57, replaces the successful Eleuthera 60 and represents a very apt distillation of this builder’s experience and expertise. 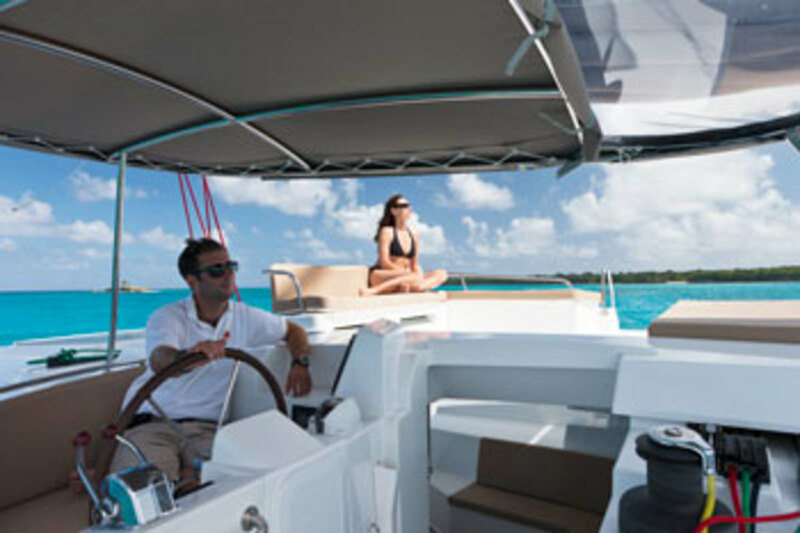 Winner of SAIL’s 2013 Best Boats award in its category, the Sanya offers an object lesson in how to maximize comfortable accommodations on a cruising cat without unduly sacrificing aesthetics or performance. The balsa-cored hulls are vacuum-bagged and resin-infused, with vinylester resin used in the exterior laminates layers to resist osmosis and blistering. The decks are injection molded. 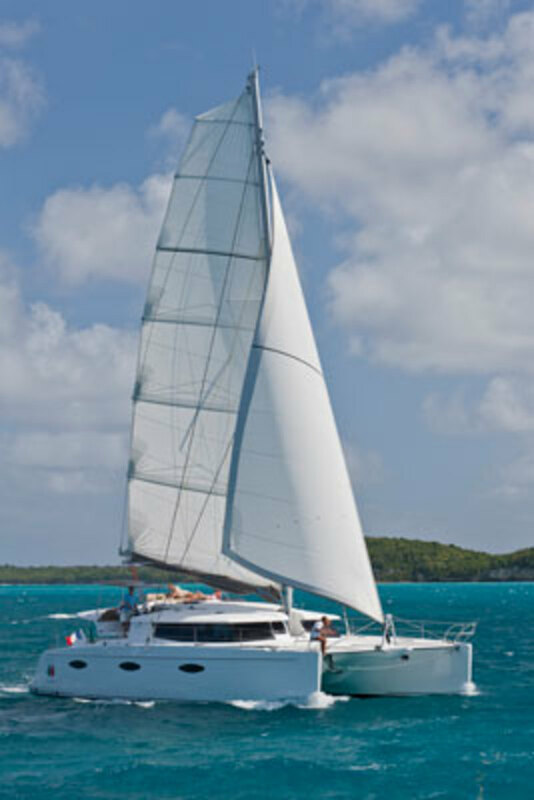 In terms of its basic design, the boat is fairly conventional as far as cruising cats go. The need to maximize interior volume means hulls are not very narrow and bridgedeck clearance is somewhat limited. There’s a fair bit of solid deck forward of the mast, and the underwater foils are a pair of long, shallow fixed keels. Boarding the Sanya 57 through one of its open transoms, one is instantly struck by the spaciousness and elegance of the aft deck area. The boat’s tender is tucked neatly under a large open sun deck that protrudes from the stern and thus is barely noticeable. 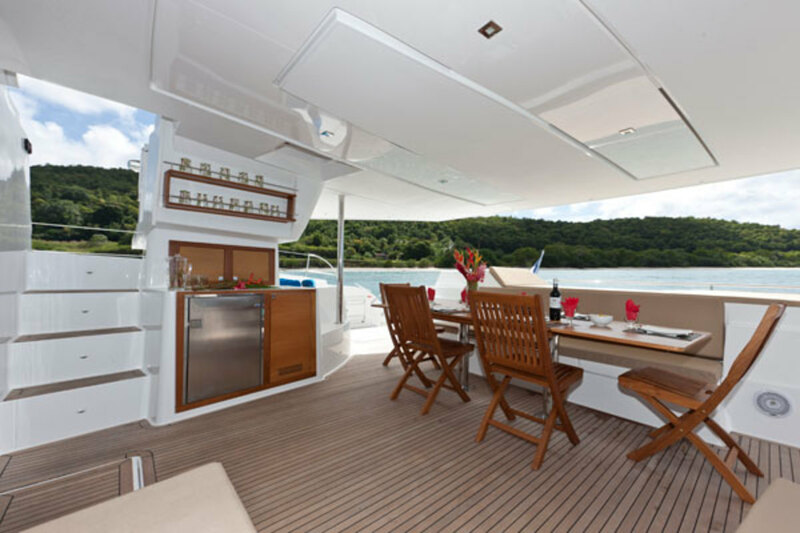 The expansive teak-decked lounging area forward of the sun deck is sheltered by a hardtop targa roof and features a long L-shaped settee, an open dining table with chairs and a nifty wet bar with a sink and a small fridge. No rigging or working lines intrude on this space, so that its social function is sacrosanct. Take four short steps up an open stairway just left of the wet bar and you arrive at the boat’s nerve center. Here you find a low-profile helm station with well-situated instrument displays set behind a bank of three winches. All working lines are led here, save for the headsail’s furling line, which is still easily accessible, just a step to the right on the starboard rail. Better yet, all line runs are clean and efficient, without lots of friction-inducing twists and turns, and there’s plenty of space for dealing with line tails. There’s a nice rail on which to hang coils, a large line bag, plus a convenient belowdecks line locker. If you’re sailing the boat hard and want to keep active lines ready to run, you can always just toss them down the stairway to your left and let them splay about the aft deck a bit. Left of the helm is another social zone atop the targa roof, where guests can lounge on a low settee or sunbathe on a banquette while chatting with the working crew. The clearance for the main boom directly overhead is carefully calculated so that there’s enough room to keep guests from feeling cramped (though they will want to watch their heads during power-gybes), but not so much that it isn’t within easy reach of the crew when tending the mainsail. The interior living spaces are, in a word, palatial. 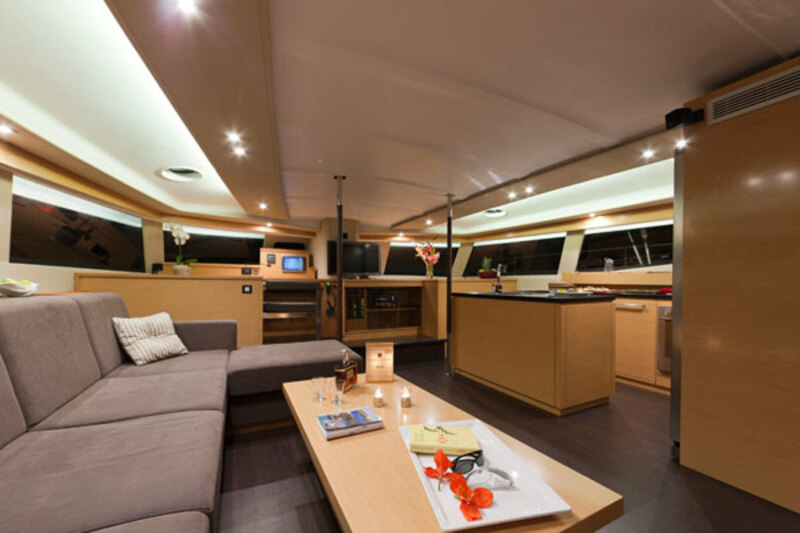 The saloon on our test boat featured an enormous settee and low-set coffee table to port (a dedicated dining table can also be specified) and a fantastic galley to starboard. Forward there was an elegant nav station to port, with a pop-up console to house a chartplotter and other electronics, and an entertainment center, with a large retractable flat-screen TV, to starboard. Most notable in the galley were the huge American-sized double-door fridge (complete with automatic water and ice dispensers in the freezer door), the large twin sinks and a full-size dishwasher. I found oodles of working counter space here and a dedicated space for a microwave oven, but I was a little surprised to see that storage was a bit tight. There is no obvious secure space in which to store glasses, and there are no raised lockers. The sleeping quarters down in the two hulls seem to go on forever. Our boat featured the charter layout, with three staterooms in each hull (the center stateroom to starboard is somewhat smaller, and is tagged as a skipper’s space), plus some vestigial crew quarters up in the two forepeaks. A five-stateroom layout, with an enormous owner’s cabin to port, is also available. All staterooms have en suite heads with separate showers, save the skipper’s quarters, which lacks only the separate shower space. The cabins on both sides are accessible through twin companionways, so no one need traipse through someone else’s bedroom to get to theirs. Finish quality throughout the interior was excellent for a mass-production boat. Everywhere you look you see hardwood parquet or veneers, leather and fabric, with no exposed fiberglass surfaces anywhere, except in the heads. I sailed the Sanya in about 15 knots of true wind on Chesapeake Bay off Annapolis. The sea state was relatively flat, though it was a bit choppy out in the middle of the bay. Our test boat had the shorter charter rig, as opposed to the full-size performance rig, which is almost 12 feet taller. The boat sailed moderately well to windward, carrying 7.5 knots of speed over the ground in 20 knots of apparent wind at a 45-degree apparent wind angle. Easing the sheets a bit, we picked up the pace to 8.2 knots at a 50-degree apparent angle and were fastest at a 65- to 70-degree angle, topping out at 9 knots. Bearing away to put the wind aft of the beam, our speeds dropped to 6 to 7 knots as the apparent wind speed fell to 12. There is a short fixed bowsprit forward for flying an A-sail or a screecher at deeper sailing angles, but we had only working sails for our test. Not surprisingly, I found the helm had little or no positive feedback. The steering system is hydraulic (it’s a very long way from the helm to the rudders), and I found it difficult to steer accurately to the compass or apparent wind indicator. I did much better steering to landmarks in the distance. The boat’s motion was quite smooth, and even in the short chop out in the middle of the bay it showed little tendency to hobbyhorse. As you’d expect aboard a catamaran, close-quarters maneuverability was excellent, thanks to the twin engines in the two hulls. At speed, the boat moved easily along in excess of 8 knots with the two 75-hp diesels turning a bit over 2,000 RPM. The systems on the whole seemed well laid out, and I was particularly impressed with the standard 680-watt solar array on the targa roof behind the main traveler. House power is 24 volts (serviced by twin 24-volt alternators), plus there are two 12-volt alternators feeding two 12-volt cranking batteries for the engines. For a large production cruising cat, this is as well thought out a boat as you are likely to find. The boat’s low profile and discreet tender stowage system make it exceedingly attractive visually, and the overall finish quality is above average. The helm station and working line arrangement is exceptional. The accommodations are exceedingly comfortable.